When I was a kid, there was nothing that compared with the giddy excitement of looking in your Valentine cubby and seeing who sent you a Valentine and what it said. 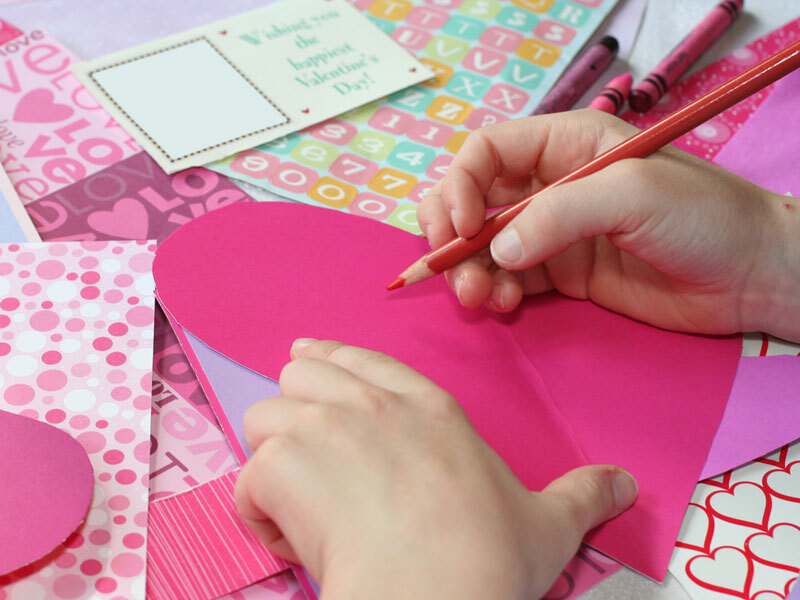 Now you can live vicariously through your kids and help them create some personalized, crafty Valentines. 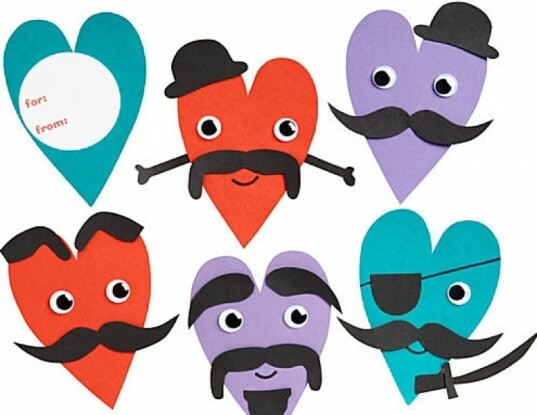 Here are some options for DIY Valentines that are easy enough for kids to make, most of them without an extra trip to the craft store! Potato print valentines are cute, natural, and give a purpose to that sad old potato with many eyes. Halve a potato then cut out a heart or star or whatever design you like into the potato, either using a knife (carefully!) or by pressing a cookie cutter firmly into the potato. Dip the shape into paint and decorate. 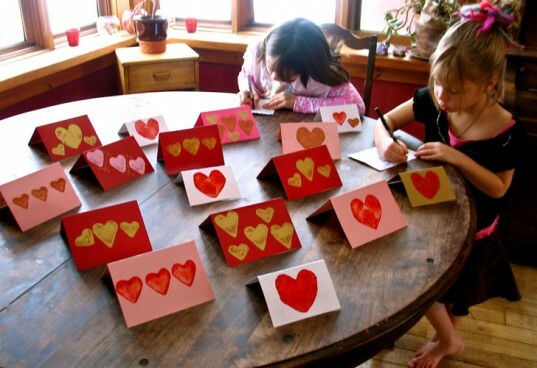 For close buddies, your child can make a Valentine keepsake. Round up any small pocket mirrors (for some reason, we always seem to have extras of these.) Most craft stores also carry small mirrors in various shapes including hearts. 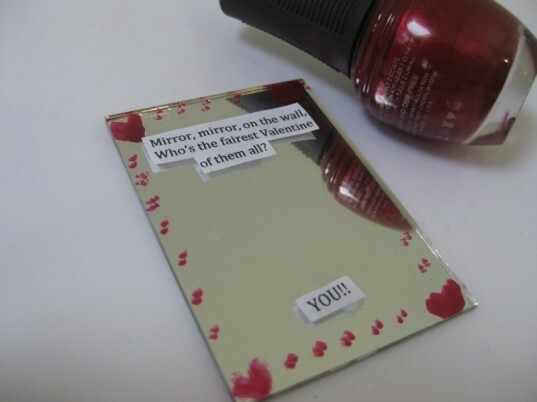 Use leftover nail polish to decorate the mirrors with hearts, squiggly lines, or dots. This same decorating technique could be used on any leftover tiles from various redecorating/remodeling projects. For younger kids for whom breakable Valentines would be a shaky proposition, use aluminum foil glued onto paper or try some metallic craft paper. 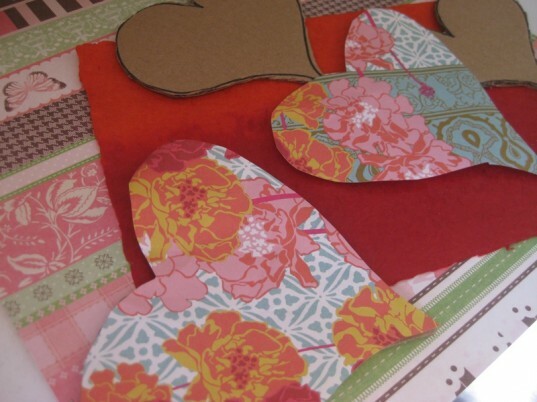 Cut cardboard into heart shapes and cover both sides with pretty scrap paper, or cover one side with pretty paper and the other side with basic white. Have kids write or type a message or draw a picture and paste it onto the hearts. We punched holes in our hearts and strung them with ribbons so that people could dangle their hearts from doorknobs or over desk monitors and have a cheery love-filled reminder throughout the year! Paper Source is well-known for their craft kits as well as their commitment to sustainable sourcing for paper products, and this one is especially clever. All you need are some google-y eyes to recreate this inspired idea at home with any expression you want and using any materials you may have lying around. By using different color yarn for hair, scraps of fabric for a hat or scarf, etc., kids can even personalize the Valentines to look like other tots from their class! Using stamps and stickers to make Valentines is an oldie but a goodie, after all, who doesn’t have about 200 random stickers in a pile (or piles) around the house? Super crafty kids can make their own lino block prints – check out the cool how to here. For younger kids, just set out some stamps and stickers (they don’t even have to be Valentine-themed) and have kids go to town. Part of the fun is coming up with a cute, corny saying to go with their creations, such as “I’m wild about you” to accompany animal stamps or stickers. 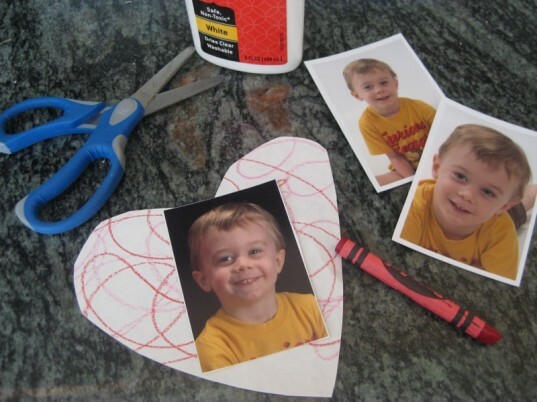 One of the easiest and most personal DIY Valentines to create is to use extra school pictures mounted on colorful paper. Kids can write a little message on the back or simply print out a sheet of labels to stick on the back that say, "Happy Valentine's Day!" Using stamps and stickers to make Valentines is an oldie but a goodie, after all, who doesn't have about 200 random stickers in a pile (or piles) around the house? Super crafty kids can make their own lino block prints - check out the cool how to here. For younger kids, just set out some stamps and stickers (they don’t even have to be Valentine-themed) and have kids go to town. 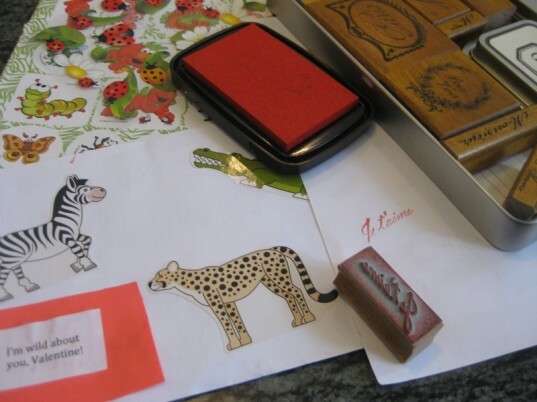 Part of the fun is coming up with a cute, corny saying to go with their creations, such as “I’m wild about you” to accompany animal stamps or stickers.